Nice review of a nice knife. I recently got one myself and have been using it as an edc. It is large for that purpose but the light weight makes is very easy. You are correct, not a knife you can snap open but smooth enough that the thumb stud is easy to use. Nice photos. Hey man, thanks for the comment. Glad we see eye to eye on this one, it is a nice knife. I’d like to see this without that teflon coating. I’m going to have to get one and get rid of it. Good knife otherwise for the price. Thanks for the review! Apparently it’s pretty easy to strip this coating off – I might actually do it with the Clip Point version. Wold be sweet if they stonewashed it like the Voyagers! Well worth the 50 bones though – very solid offering from Cold Steel. Hey Jay, I have seen a couple where people have polished up the blade and I agree – it looks really really sweet. A little grip tape is a great way to add some traction without marring up your thumb ramp! Enjoy your new knife dude, feel free to let me know what you think once you get your hands on it! hey, would you recommend this OVER the Kershaw ZT 0350? I’m looking to use it for survival course, edc, cutting boxes and cardboard, ropes, and self defense. 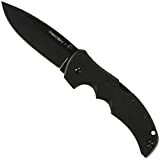 Hi Nate, given a choice between the two, I would take the ZT 0350 over the Recon 1. However, it is important to keep in mind there are a lot of differences between the two knives. First of all, the ZT costs twice as much. However, there are important differences in the blade shape, materials, origin of manufacturer, method of deployment, lock, etc etc. They are both solid knives and represent good values for their price points – but beyond that I very much view it as an apples to oranges comparison. What kind of survival knife would you suggest for a soldier where the weather is hot and dusty. price range is 80 to 100 bucks. Becker Knife and Tool makes a number of nice models that would probably do well in that sort of role. I happen to like the BK7 but the smaller BK16 and BK17 might be better for your needs (they are smaller and more lightweight – haven’t handled them yet myself). All of their knives are made in high carbon 1095, which would do well in a hot and dusty environment. And i’m pretty sure that there is a review of the Seal Pup Elite on here….. Right Mr Dan? Hi greetings from Vancouver Canada.I bought the mini Recon1 and I love it,very tough andbas you mentioned that is one tough lock up nice review. Very cool Michael! Glad you are enjoying your Mini Recon 1. I like that smaller size and glad to hear the lockup is just as robust as the first one. Looking forward to a Recon 1 review with their new CTS steel, which to me seems VERY enticing . A Triad lock with better steel around $100- I’m in! Finding almost no reviews with this version. I plan on at least acquiring a new Code 4 in CTS-XHP, which is basically a Recon 1 with aluminum scales. I’ll try to order one this week. I’ve decided to pass on the Recon 1 only because it doesn’t open easily. I carried a different knife (can’t remember the name – “Gerber” maybe,) but it pulled my cookies out of the fire when I was accosted by two individuals at 3 a.m. in Rochester NY. I love “Cold Steel”products but I suspect that the outcome could have been quite different if I stood there fumbling with a knife that doesn’t open easily. Can you recommend a Cold Steel multipurpose folder that will open as easily and authoritatively as my old one? Yes the lock on these can be a little difficult to overcome – especially in a high stress situation like the one you described. Frankly, that story is incredible. I am glad to hear you are OK.
To try and answer your question, my Cold Steel Rajah III is very easy to open, either with my thumb or by using the wave. The blade shape may be a bit ridiculous, but the knife has no problem opening up, and makes a nice snap. I am not sure what else I would recommend in the CS lineup. I wasn’t aware of the Rajah III. I’ll check it out but I want a folder for general use and only incidentally for self-defense. I’d want my Tanto San Mai III in a threat situation. The story is true. I guess I looked like an easy mark, but they apparently decided to disengage when they realized that I was armed, prepared to fight, and didn’t freak out. I should acknowledge that conventional wisdom would be to hand over what an assailant demands. If they had firearms or otherwise chose to fight, my actions could have gotten me killed. This knife is not made in the USA…it is made in Taiwan…you need to zoom really big to see on the knife blade..Made in Taiwan…I contacted Cold Steel to see if they would stand behind their product and take back their knife and reimburse me…not happening…you can tell alot about a compagny when they do not want to take back their made in Taywan knife…buyer beware…please encourage real 100% made in the USA knife makers and not one that is emetating it. Thanks for stopping by and leaving a comment. They now offer these in S35VN steel, which is a small upgrade over S30V and a considerable upgrade from the original AUS-8 knives. It takes the classic Recon 1 design and makes it that much better. That said, if you have the AUS-8 version it’s still perfectly serviceable, and it was significantly less expensive then the new S35VN version. I still carry and use my American Lawman in AUS-8. I hope your Recon 1 provides many years of service.